You'd be forgiven for thinking that the photo below has been shopped. The bodybuilder is such an unnatural yellow colour that it looks like the photo was taken with a filter. Well, we're sorry to disappoint you: it's for real. You are looking at a medical wonder - the first liver defect in a steroids user caused by a malfunctioning heart. Very, very, very rare. The bodybuilder in the photo is forty. He drinks almost no alcohol, takes no medicine – but, yes, he does use steroids. For the last ten years he's been on juice almost continuously, with eight-week steroids courses and a couple of weeks' rest in between. He takes methandrostenolone, stanozolol and oxymetholone and injects nandrolone decanoate, testosterone enanthate and trenbolone enanthate. The latter is his favourite, and he takes up to seven hundred milligrams per week. The bodybuilder fell ill about a month ago. He was tired, felt nauseous and couldn't train. 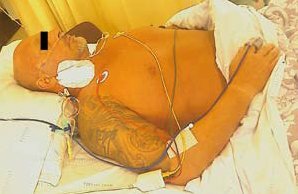 He stopped taking steroids, but his condition continued to deteriorate. Four days before he called the doctor his skin had turned yellow. He had stomach cramps and had to vomit. Liver and kidney malfunction, the liver specialists at Santa Maria University in Portugal concluded after a blood test. The doctors feared the man would need a liver transplant. So they started up the process to get the man on the waiting list. Then, more or less by chance, they discovered that there was something wrong with his heart. There were big blood clots in two ventricles, and as a result the organ had almost stopped functioning. And that was the cause of the liver problem: the bodybuilder's liver wasn't getting enough blood. The doctors gave the bodybuilder blood thinners, which dissolved the blood clots. After two weeks he was allowed home. Whether he will recover completely the doctors don't know, but they know he's already back at work – as a bouncer at a disco. And no doubt he's back on steroids too. World J Gastroenterol. 2009 Jun 21;15(23):2920-2.